Flight has conferred an extraordinary advantage to some groups of animals. Wing shape is directly related to flight performance and evolves in response to multiple selective pressures. In some species, wings have ornaments such as pigmented patches that are sexually selected. Since organisms with pigmented wings need to display the ornament while flying in an optimal way, we might expect a correlative evolution between the wing ornament and wing shape. We examined males from 36 taxa of calopterygid damselflies that differ in wing pigmentation, which is used in sexual displays. We used geometric morphometrics and phylogenetic comparative approaches to analyse whether wing shape and wing pigmentation show correlated evolution. We found that wing pigmentation is associated with certain wing shapes that probably increase the quality of the signal: wings being broader where the pigmentation is located. Our results also showed correlated evolution between wing pigmentation and wing shape in hind wings, but not in front wings, probably because hind wings are more involved in signalling than front wings. 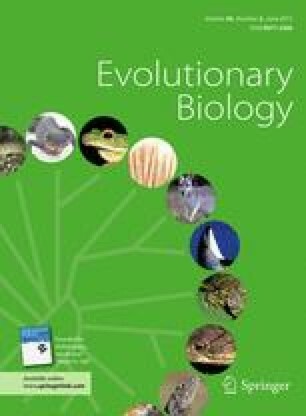 The results imply that the evolution of diversity in wing pigmentations and behavioural sexual displays might be an important driver of speciation due to important pre-copulatory selective pressures. The online version of this article (doi: 10.1007/s11692-012-9214-3) contains supplementary material, which is available to authorized users. We are very grateful to G. Arnqvist who contributed with useful comments to this work. We thank K. D. B. Dijkstra for his support at the NCB Naturalis of Leiden and Gunvi Lindberg for her help at The Swedish Museum of Natural History in Stockholm. We also want to thank P. Brunelle, A. Córdoba-Aguilar, R. Futahashi, D. Halstead, I. Santoyo, G. Sims, Y. Tsubaki, H. Ubukata and X. Yu for their help in providing us with some of the taxa. We are also grateful to M. Hämäläinen who helped us with the determination of some of the taxa for this study. This study has been supported by a postdoc position to D. Outomuro from the Spanish Ministry of Education. D. C. Adams was supported in part by NSF grant DEB-1118884 and F. Johansson was supported by The Swedish Research Council. Rohlf, F. J. (2004). tpsSplin. Thin-plate spline version 1.20. Available at: http://life.bio.sunysb.edu/morph/. Rohlf, F. J. (2010a). tpsDig version 2.16. Available at: http://life.bio.sunysb.edu/morph/. Rohlf, F. J. (2010b). tpsRelw. Relative warps version 1.49. Available at: http://life.bio.sunysb.edu/morph/.